Credit: Yaron Fuchs and Samara Brown in the lab of Hermann Steller, Rockefeller University. Whether injured by a scrape, minor burn or knife wound, skin goes through the same steps to heal itself. Regrowing hair over new skin is one of the final steps. All the hair you can see on your body is non-living, made up of “dead” cells and protein. 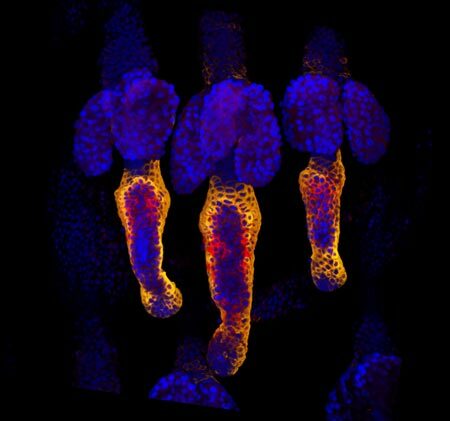 It sprouts from living cells in the skin called hair follicle stem cells, shown here in red and orange. For more pictures of hair follicle stem cells—and many other stunning scientific images and videos—go to the NIGMS Image and Video Gallery. Influenza virus proteins in the act of self-replication. Credit: Wilson, Carragher and Potter labs, Scripps Research Institute. Flu viruses evolve rapidly, often staying one step ahead of efforts to vaccinate against infections or treat them with antiviral drugs. Work led by Jesse Bloom of the Fred Hutchinson Cancer Research Center has uncovered a surprising new flu mutation that allows influenza to infect cells in a novel way. Normally, a protein called hemagglutinin lets flu viruses attach to cells, and a protein called neuraminidase lets newly formed viruses escape from infected cells. Bloom’s lab has characterized a mutant flu virus where neuraminidase can enable the virus to attach to host cells even when hemagglutinin’s binding is blocked. Although the researchers generated the neuraminidase mutant studied in these experiments in their lab, the same mutation occurs naturally in strains from several recent flu outbreaks. 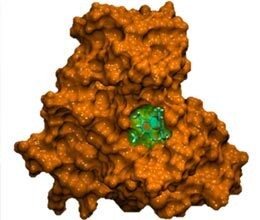 There’s a possibility that flu viruses with such mutations may be able to escape antibodies that block the binding of hemagglutinin. This work also was funded by NIH’s National Institute of Allergy and Infectious Diseases. 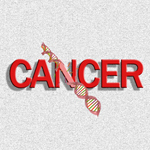 Cancer tumors are like snowflakes—no two ever share the same genetic mutations. Their unique characteristics make them difficult to categorize and treat. A new approach proposed by Trey Ideker and his team at the University of California, San Diego, might offer a solution. Their approach, called network-based stratification (NBS), identifies cancer subtypes by how different mutations in different cancer patients affect the same biological networks, such as genetic pathways. As proof of principle, they applied the method to ovarian, uterine and lung cancer data to obtain biological and clinical information about mutation profiles. Such cancer subtyping shows promise in helping to develop more effective, personalized treatments. 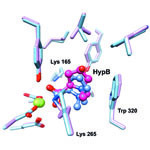 The image shows a comparison of the predicted binding of the substrate to the active site of HpbD (blue) with the binding sites determined experimentally by crystallography (magenta). Credit: Matt Jacobson, University of California, San Francisco; Steve Almo, Albert Einstein College of Medicine. 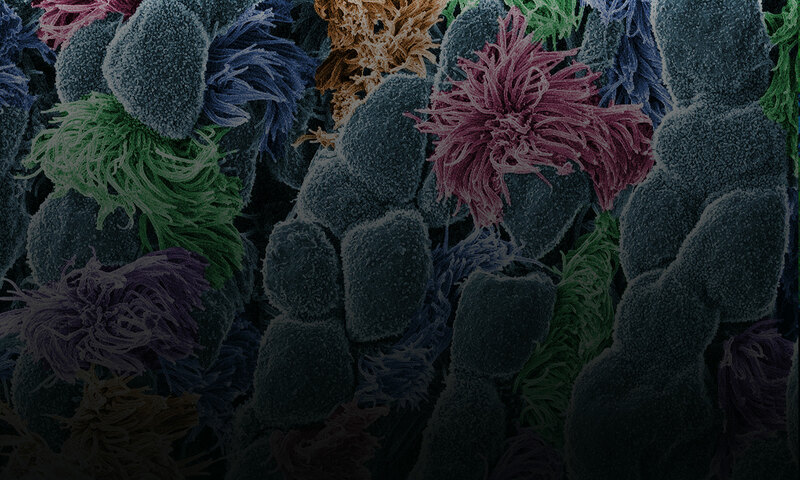 Sequencing the genomes of almost 7,000 organisms has identified more than 40 million proteins. But how do we figure out what all these proteins do? 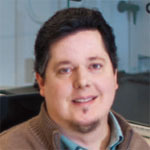 New results from an initiative led by John Gerlt of the University of Illinois suggest a possible method for identifying the functions of unknown enzymes, proteins that speed chemical reactions within cells. Using high-powered computing, the research team modeled how the structure of a mystery bacterial enzyme, HpbD, might fit like a puzzle piece into thousands of proteins in known metabolic pathways. Since an enzyme acts on other molecules, finding its target or substrate can shed light on its function. The new method narrowed HpbD’s candidate substrate down from more than 87,000 to only four. Follow-up lab work led to the actual substrate, tHypB, and determined the enzyme’s biological role. This combination of computational and experimental methods shows promise for uncovering the functions of many more proteins. 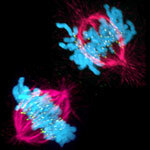 This image shows a cell in two stages of division: prometaphase (top) and metaphase (bottom). To form identical daughter cells, chromosome pairs (blue) separate via the attachment of microtubules made up of tubulin proteins (pink) to specialized structures on centromeres (green). Credit: Lilian Kabeche, Dartmouth. Such bad connections can cause chromosome segregation errors that lead to cells with an abnormal number of chromosomes, a hallmark of cancer cells. So in addition to aiding our understanding of a fundamental biological process, the new insights may point to potential ways to correct such errors. 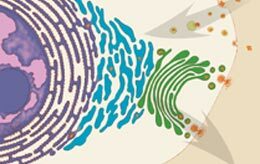 The winners of the 2013 Nobel Prize in physiology or medicine discovered that cells import and export materials using fluid-filled sacs called vesicles. Credit: Judith Stoffer. Every October, a few scientists receive a call from Sweden that changes their lives. From that day forward, they will be known as Nobel laureates. This year, five of the new Nobelists have received funding from NIGMS. 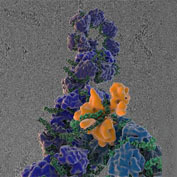 In physiology or medicine, NIGMS grantees James Rothman (Yale University) and Randy Schekman (University of California, Berkeley) were honored “for their discoveries of machinery regulating vesicle traffic, a major transport system in our cells.” They share the prize with Thomas C. Südhof of Stanford University. Rothman and Schekman started out working separately and in different systems—Schekman in yeast and Rothman in reconstituted mammalian cells—and their conclusions validated each others’. It’s yet another example of the power of investigator-initiated research and the value of model systems. Highly accurate molecular models like this one are based on computational techniques developed by the winners of the 2013 Nobel Prize in chemistry. Credit: Rommie E. Amaro, University of California, San Diego. The three Nobelists in chemistry are NIGMS grantees Martin Karplus (Harvard University), Michael Levitt (Stanford University) and Arieh Warshel (University of Southern California), who developed “multiscale models for complex chemical systems.” They used computational techniques to obtain, for the first time, detailed structural information about proteins and other large molecules. Because of that work, scientists around the world are now able to access, with a few keystrokes, highly accurate models of nearly 100,000 molecular structures. Studying these structures has advanced our understanding of countless diseases, pharmaceuticals and basic biological processes. At the age of 18, Brad Duerstock had a devastating accident. A star member of his high school swim team, Duerstock hit his head during practice in a way that broke his neck and paralyzed all of his limbs. Today, he studies spinal cord injuries much like his own, investigating how the damage occurs and how it could possibly be repaired. Duerstock has worked to make science accessible to people with disabilities, whether they use wheelchairs, as he does, or have visual or other impairments. For example, he has redesigned laboratory space to make it easier for people with disabilities to navigate and perform tasks. “I like knowing that what I do can ultimately impact others,” Duerstock says. Much of Duerstock’s research deals with what occurs immediately following a nerve injury. In a spinal cord injury, nerve tissue becomes severed or dies. The immune response and bleeding in the injured area can cause extra damage to nerves in the spinal cord. Duerstock and his team have found that a molecule called acrolein is produced in spinal cord injuries and that it kills the nerves it encounters as it spreads around the injury site. They have been investigating a compound called polyethylene glycol (PEG), a polymer that could seal ruptured nerve cell membranes, possibly protecting nerve tissue from further damage immediately following a spinal cord injury. Duerstock also founded and leads the Institute for Accessible Science (IAS) , a community of scientists, students, parents and teachers whose goal is to promote better accommodations for people with disabilities who are studying or working in the sciences. The IAS looks into how to redesign lab spaces and equipment to increase accessibility for people with disabilities, particularly those with limited mobility or vision. Content adapted from the NIGMS Findings magazine article Opening Up the Lab.